Soft Matter (polymer, liquid crystal, colloid, foam, and so on) is an important class of materials. Soft Matter Physics focuses on the interface between physics, materials, chemistry and biology. We aim to address some questions and problems in non-equilibrium phenomena in soft matter systems by using rheo-physics methods. Our interest covers wide range of non-equilibrium soft matter phenomena ranging from rheology of non-equilibrium soft matter such as nematic liquid crystal under electric field and active biological matter, new material phase with topological defect, and so on. 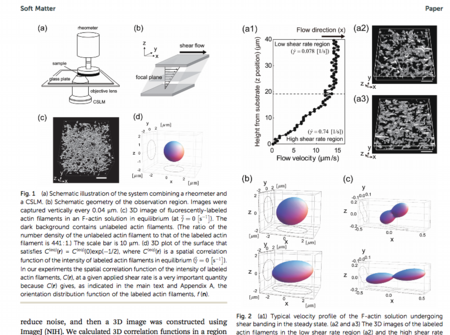 (5) Rheology of liquid crystal turbulence. For details, please see our project description. Soft Matter Physics Lab since 2016-12-20 / Copyright 2016 Soft Matter Physics Group. All Rights Reserved.